Cases from the Hartlepool area dealt with at Teesside Crown Court include the following. 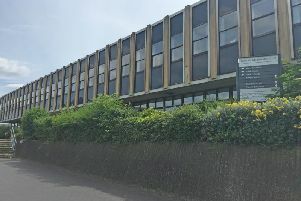 A youth worker who attacked a woman during a drunken argument has been given a suspended prison sentence after leaving her with a fractured skull and a brain injury. The victim, his partner's cousin, suffered a brain injury when Jeffrey Woodward, 44, pushed her over in the street after the women arrived drunk at his home in Hartlepool. The judge in the case said the attack had 'catastrophic effects' on the victim after Woodward admitted to inflicting grievous bodily harm. Woodward lost his job over the incident on April 29 last year after a disciplinary hearing, Teesside Crown Court was told. Prosecutor Jenny Haigh said that the victim, Linda Foster suffered a hairline skull fracture to the side of the head, an air bubble to her brain and injury to her eye. The court heard she lost her new job at a supermarket and she suffered headaches and dizzy spells for 12 weeks, and doctors told her that she would not be able to perform certain tasks for 10 weeks because of the injury to her brain. Miss Haigh said that Woodward lost his temper when the women turned up drunk and then they took a bottle of wine up to a bedroom to continue drinking. Woodward, who had also been drinking, followed them upstairs and he ordered them to get out of the house, pushing Miss Foster out of the door. She fell backwards, losing consciousness, and she woke up back inside being tended to by her cousin before an ambulance took her to hospital. Martin Scarborough, defending, said that Woodward had been drinking at home that afternoon. He was now living on benefits after losing his job over his behaviour, but he hoped to start work next month. The Recorder of Middlesbrough, Judge Simon Bourne-Arton QC told him: "It was an assault on her with catastrophic effects. "All three of you had been drinking heavily according to your respective accounts and it was you who lost your temper and ordered her out of the house. "I accept it was a push." Woodward, of Durham Street, Hartlepool, was given a 12 months jail sentence suspended for two years, 22 hours unpaid work, and ordered to any £2,500 compensation.